Domestic Issue is a microgame found in the Ninja Scribble stage in WarioWare: Touched! 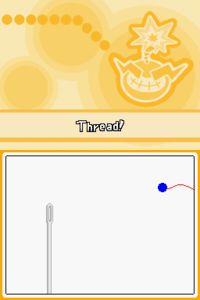 The objective of the game is to draw a line from the end of the thread, through the eyes of the needles. 1st level difficulty: The player must draw across 1 needle eye. 2nd level difficulty: The player must draw across 2 needle eyes. 3rd level difficulty: The player must draw across 3 needle eyes. This page was last edited on February 8, 2019, at 19:16.